Trying to decide whether to buy Asia Black 25 by Cloma Pharma? Read our unbiased review of Asia Black 25 before you make a decision. 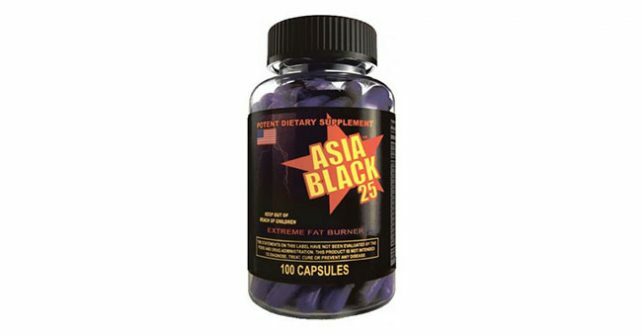 Asia Black 25 is an Ephedra fat-burning supplement that claims to help you burn fat by turning up your core body heat so your body burns more of your stored energy – which is fat. After reading through many reviews online about Asia Black 25, I have come across terms like ECA Stack and Ephedra – which surprisingly, nobody took the time to explain what they are and why they are important in the formula. Ephedra is extracted from the plant Ephedra Sinica for medical purposes. Ephedra is a source of Ephedrine, a thermogenic compound designed to raise your core body temperature. An ECA Stack is a combination of Ephedrine, Caffeine, and Aspirin to help lose weight. Ephedrine and Caffeine act as thermogenics, and Aspirin acts as a blood thinner in order to speed up metabolism. These terms are important in the development of Asia Black 25 since these are the effects that Asia Black 25 promises to provide. The real question is whether Asia Black can live up to its promises. As we have learned with testing thermogenic fat burning pills, you can notice a change in almost anything with at least 100mg of caffeine. Asia Black is no different. Experiencing caffeine effects, however, does not directly correlate with burning fat. In many of the reviews we have encountered, some reported modest fat loss, while many others discussed the adverse effects they experienced when using Asia Black 25. Many reviews detailed their struggle with nausea, vomiting, insomnia, hyperventilation, hypertension, and even angina. Aside from its thermogenic effects, caffeine also helps to keep you energized when you work out. These effects would only work if you have an active lifestyle AND a workout program. For many people who are busy with work or school, all this would do is make you sweat for a bit and give you insomnia at best. For people who could only commit to supplements to burn fat, a better choice would be to use all-natural fat burning pills like Garcinia X or Flat Belly. It’s an established fact in the industry that ephedrine could act as an appetite suppressant and thermogenic, which leads to fat loss in the skeletal muscle. Its dosage and long-term use have been debated for at least a decade, with manufacturers and the FDA often discussing the dangers of side effects. Safe levels of Ephedrine were recommended by the FDA to minimize its adverse effects on the user. Unfortunately, the supplement facts on Asia Black 25 do not reveal the dosage of Ephedrine as well as its caffeine and aspirin content. This is very risky since Ephedrine is known to cause very serious conditions such as heart attacks, strokes, and pulmonary embolisms. It would have helped cement Asia Black 25 as a trusted brand by disclosing the dosage on their pills, but sadly, Cloma Pharma thought that it was best to enclose the formula in a veil of secrecy instead. The government regulations are in place for a good reason. Adverse effects of products – especially fat burning products, should be taken seriously. Apparently for the makers of Asia Black 25, it was more important to sell than to inform.